If you hadn’t heard, eSports is booming. Bringing in over $137bn last year and estimated to grow to more than $180bn by 2021, the industry now includes fast-growing gaming platforms, millions of hours of views per month, live tournaments, top pro-gamers earning in excess of half a million per month and sponsorship deals from the likes of Red Bull, Coca-Cola and Mercedez-Benz. The billion-dollar projections come as no surprise as the large titans of tech are moving into the space, with recent announcements from Google, Apple and Facebook regarding new video game services and Amazon’s “suspicious” developer-hiring behaviour. Skilled and experienced consultants in infrastructure, graphics, big data and nearly all flavours of development are all in the enviable position of being in hot demand. Google announced their first streaming game platform Stadia during the Game Developers Conference in March 2019. Stadia, a cloud-based platform has been created with the goal of merging the community of players, viewers and streamers through games accessible to anyone with an internet connection. Google has made this all possible due to its huge infrastructure network, by recruiting some of the brightest minds from Xbox and Playstation and by partnering with large graphics and gaming engine companies such as Unreal, Unity, and Vulkan. Google wants to end loading wait times, with games available to play within 5 seconds of clicking a link and introduced a controller with easy share/stream functionality as well as a Google assistant to help gamers with in-game challenges. To develop Stadia, they have taken inspiration from the thousands of streamers on platforms such as Youtube and Twitch and introduced some interesting innovations. Streamers will be able to share a point in gameplay and challenge their followers to either replicate or better their performance. They have also introduced ‘Crowd Play’ which will allow stream viewers to queue to join a streamer in their next round of play. Google has not yet confirmed a launch date, pricing model (monthly cost or a charge based on game play) or a full list of games that will be available but they have opened up the Stadia platform for developers, where they can apply to create games for this new technology. With its huge and growing infrastructure, Amazon is another giant hoping to gain a large slice of the market. 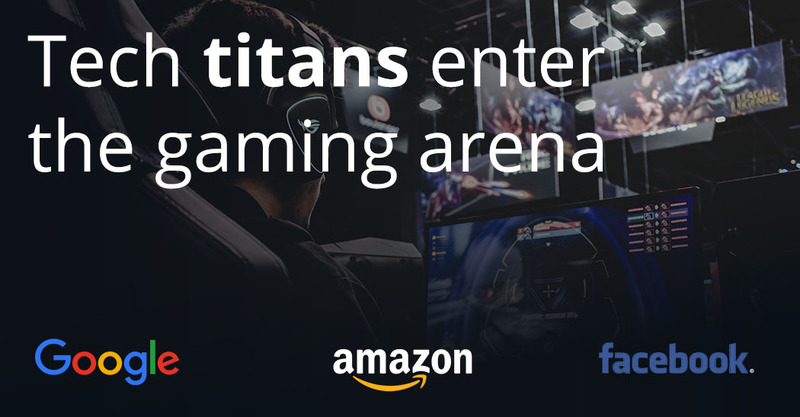 Back in 2014, Amazon purchased Twitch, the world’s leading game-streaming platform where users can watch live streams of professional players, broadcast their own gameplay and interact with the huge gaming communities. Twitch has over 15 million daily active viewers and over 2.2 million video creators who share their games live on Twitch monthly. Fortnite, the most popular game streamed on Twitch is watched a collective 95 million hours each month. There have been rumours that Amazon might join the streaming game developers’ club after a number of jobs looking for developers and AI engineers “to work on Cloud Games”, “to shape the foundation of an unannounced AAA games business” and for a “never before seen kind of game” have been spotted listed on their job board. Watch this space. Apple has a share in the industry already thanks to the App Store, with the majority of its revenue coming from games. They recently announced “Arcade” – a Netflix-style subscription that will be available to play on iOS devices, a great strategy in an age where iPhone sales are slowing down and gaming is booming. The aim of this new subscription is to create better and higher quality games to replace the current lower quality versions available on the App Store as well as getting involved in e-sports. Additional to improving the customer’s experience, Apple is looking to open opportunities for developers to use their skills and creativity and develop premium games, enabling them to replace the $1-$3 revenue for low quality ones with more sustainable products by cutting fees they would usually pay to an outside firm for user acquisition, marketing and distribution costs. It would not be the end of the App Store, however, as the idea is to change the modality by offering optional in-app purchases with a similar model to the one used in the Epic Games’ favourite Fortnite. The idea of the subscription is also not new, Microsoft already has a similar service called Xbox Game Pass and Sony has Playstation Plus, both consisting of the download-and-play format. It was a year ago in 2018, also during the GDC that Facebook announced their new tools for developers to create Instant Games. This Facebook tool allows developers to build live stream features directly into PC games without requiring any capture device or software, challenging Youtube and Twitch. Later in the year, Facebook launched Fb.gg which not only displays a collection of live and recorded video games and e-sports competitions, but it also works as a social network displaying gaming conference events, featured creators and their “Liked” pages and groups, helping viewers and gamers to get together on one platform. Facebook has also created a new program in Fb.gg called Level Up to support up-and-coming gamers by helping them build a fan base through the “fan support feature”. This program enables viewers to donate to the streamers, helping the gaming community grow and develop. Although the new cloud technology might create competition and sounds like an exciting development, it remains to be seen whether there will be large-scale take up. Internet connectivity speeds and monthly-download limits could dissuade some users, whilst others still might prefer to stick with their console, PC or gaming device. Meanwhile, the tech-innovating leaders are predicting lots of new opportunities for developers to get involved and put their ideas into practice on the new platforms. With the new AI and graphics technologies, there is no doubt that the most exclusive games are yet to come.